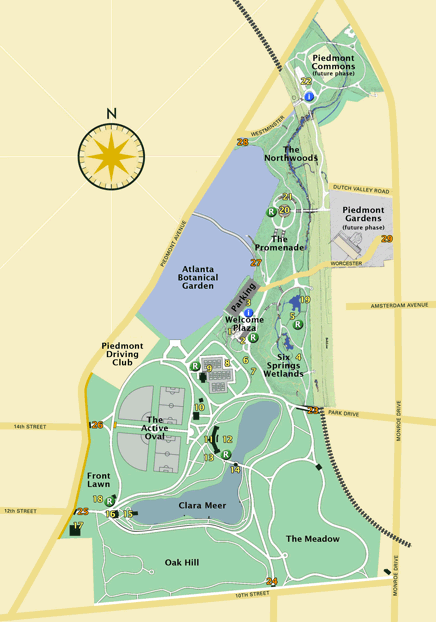 Surrounding area: It’s Piedmont Park…too many things to say. Check out the other playgrounds…Noguchi Playscapes or the Boundless Playground near the pool and duck pond, for starters! Shade: The fountains are obviously in the sun. There is a large shaded area where you can sit and watch your kids. Safety: Out in the heat of the summer, the concrete can get hot. Also, your kids need to be fully clothed and in a swim diaper. If somebody has an accident, the splashpad has to be closed down for cleaning. Cons: It is kind of far from the other amenities of Piedmont Park. If you park on the other side, it is a LOOOONNNNGGG walk. Other than that, I have no cons. Overall Assessment: I love this splashpad! The simplicity of this splashpad is just what I love most. All the jets come from the ground (like Centennial Park) with varying degrees of height and power. 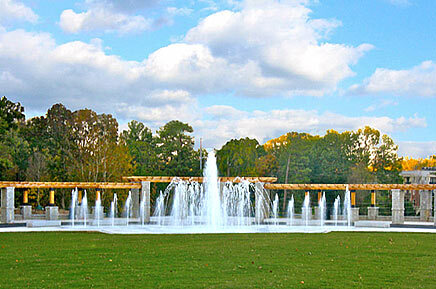 According to the Piedmont Park Conservancy Website, the fountain features more than 70 jets, reaching up to 30 feet in the air, with “magnificent” LED lighting. There is a bathroom in this area for changing. Per the City of Atlanta Parks and Recreation Department, the splashpad will run year round except in the case of freezing temperatures. Awesome! !